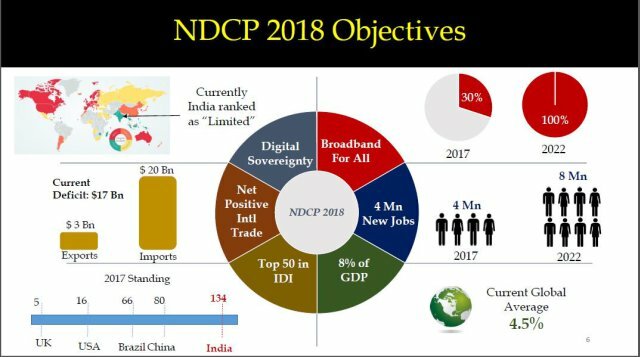 Union Cabinet has approved National Digital Communications Policy-2018 (NDCP 2018). It also has re-designated Telecom Commission as Digital Communications Commission. It replaces existing National Telecom Policy-2012 to cater to the modern needs of the digital communications sector of India. It envisions supporting India’s transition to digitally empowered economy and society by fulfilling information and communications needs of citizens and enterprises. It strives to achieve this by establishing ubiquitous, resilient and affordable digital communications infrastructure and services. It is customer focused and application driven. It will help lead to new ideas and innovations after launch of advanced technology such as 5G, IOT, M2M, etc. which shall India’s govern telecom sector. Creating four million additional jobs in Digital Communications sector. Enhancing contribution of Digital Communications sector to 8% of India’s GDP from ~ 6% in 2017. Propelling India to Top 50 Nations in ICT Development Index of ITU from 134 in 2017. Ensure internet connectivity to all uncovered areas. Attract investments of US $100 billion in Digital Communications Sector. Train 1 million manpower for building New Age Skill. Establish National Digital Grid by creating National Fibre Authority. Establish Common Service Ducts and utility corridors in all new city and highway road projects. Facilitate development of Open Access Next Generation Networks. Why such policy was needed? As the present technological world has entered into era of modern technological advancements in Telecom Sector such as 5G, Internet of things (loT), Machine to machine (M2M) communication etc. So, need was being felt to introduce customer focused and application driven policy for Indian Telecom Sector. This policy’s main intention was to serve as main pillar of Digital India by addressing emerging opportunities for expanding not only availability of telecom services but also telecom based services. Accordingly, new National Digital Communications Policy – 2018 has been formulated. The number of Indians flying are growing at about 20% a year. Indian domestic ATF is almost 50-60% costlier than in the U.S., the EU, West Asia and Asia-Pacific. Airfares in India are one of the lowest in the world on a rupee per seat-km basis. Most domestic carriers are bleeding. 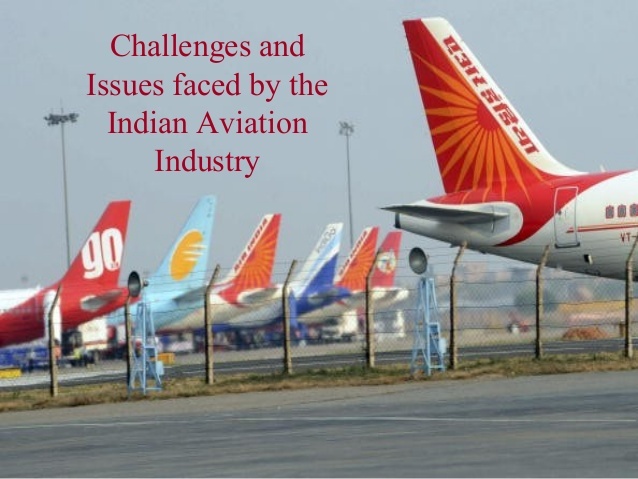 Like in the past, high oil prices, currency fluctuations and lower yields have pushed airlines into a cyclical trap with at least two full-service airlines, Air India and Jet Airways, gasping for breath. Staff salary payments have been delayed and frantic efforts are on to raise fresh capital. Most airlines have cash balances equivalent to only 2-3 weeks of expenses. CAPA estimates Indian carriers will incur a combined loss of $1.9 billion this fiscal. External factors such as oil prices and the exchange rate have contributed to headwinds. A number of long-term structural challenges are bogging the sector down. Slot constraints, insufficient parking bays and congestion at key airports, and high taxes on fuel are the main challenges. A low phase like this is the time to take tough, transformational decisions on fleet, route network, service quality, organisational processes, culture and people. The stupendous growth in aviation has given a lot of taxes to the government. Fifty months of double-digit growth came on the back of huge investments by airlines and low fares. When crude prices fell to below $40 per barrel, the Centre increased the tax rates. Now that crude oil prices are hovering around $80 per barrel, it is a fit time for government intervention. Indian domestic ATF is almost 50-60% costlier than in the U.S., the EU, West Asia and Asia-Pacific. But airfares in India are one of the lowest in the world on a rupee per seat-km basis. This contradiction has to end. India’s logistics sector is highly defragmented and very complex with more than 20 government agencies, 40 partnering government agencies (PGAs), 37 export promotion councils, 500 certifications, 10000 commodities being stakeholders in it. At present it has 160 billion market size and involves 12 million employment base, 200 shipping agencies, 36 logistic services, 50 IT ecosystems and banks and insurance agencies. Government is aiming is to reduce logistics cost from present 14% of GDP to less than 10% by 2022. As per Economic Survey 2017-18, Indian logistics sector provides livelihood to more than 22 million people. Improving this sector will facilitate 10% decrease in indirect logistics cost leading to growth of 5 to 8% in exports. Further, it estimates that worth of Indian logistics market will be around US $215 billion in next two years compared to about US $160 billion currently. 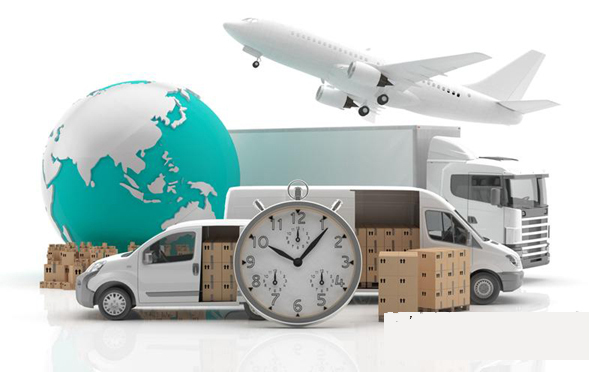 The logistics cost in India is very high compared to developed countries. High cost reduces competitiveness of Indian goods both in domestic as well as export market. Increasing globalization of Indian economy, along with renewed manufacturing vigour attributed to Make in India Campaign and growth of e-commerce business all forecast rapid growth in Indian logistics sector. India was ranked 44 in World Bank Logistics Performance Index 2018. This sector provides employment to more than 22 million people and is expected to grow at rate of 10.5% over the next 5 years. Logistics is also backbone of India’s international trade and will help in diversification of not only India’s export basket but also of products and countries. Union Ministry of Petroleum and Natural Gas has amended Petroleum and Natural Gas Rules 1959 to include shale in definition of petroleum. The updated definition of petroleum means naturally occurring hydrocarbons, whether in form of natural gas or in liquid, viscous or solid form, or mixture thereof, occurring in association with petroleum or coal or shale but does not include coal, lignite, and helium. It is fine-grained sedimentary rock that forms from compaction of silt and clay-size mineral particles, commonly called as mud. The composition of shale places it in category of sedimentary rocks known as mudstones. It is unconventional source of methane, like coal-bed gas (in coal seams) and tight gas (trapped in rock formations). It is colourless, odourless gas, lighter than air. It is cheaper than natural gas, releases 50% less CO2, hence better source for generating electricity. 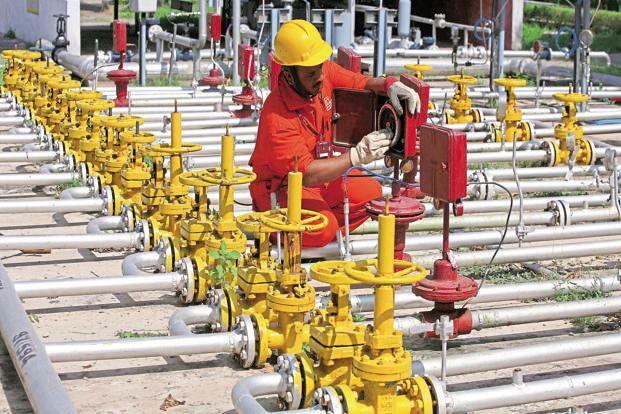 In India, potential shale gas sites are Cambay, Gondwana, Krishna-Godavari and Cauvery Basins.